In that vein, there’s storage. 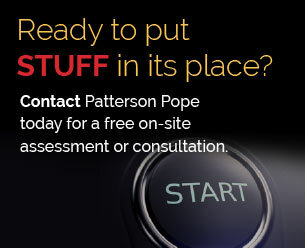 At Patterson Pope we are perfectly okay with hearing that storage is boring to you. That’s a phrase we’ve heard many times. You know what? It kinda makes us smile. We think about stuff a lot. Not in the way that teenagers think about “stuff”. No, we’re concerned with the challenges that physical stuff creates. How to store it. How to organize it. After years of thinking about and working with stuff, we’ve become very good at it. We want to take our talent, knowledge and experience and put it to work for you. Storage is not boring to us. In fact, it’s our whole reason for being; it consumes us. We live for topics like shelving and lockers and mailroom carts and modular casework and… we could go on… and in other parts of this website, we do! Choosing to let us handle your storage projects ensures that there are fewer mistakes and hold-ups, saving you time and money. We’ll handle the details, because that’s what we love. Our goal is to be a resource and partner for the Architect and Design community. By doing what we do best, we can help you make wise choices, save you time and help you avoid pitfalls. The outcome leads to successful projects and happy clients.